One of Arrow's most popular, exciting &amo; profitable games of all time! 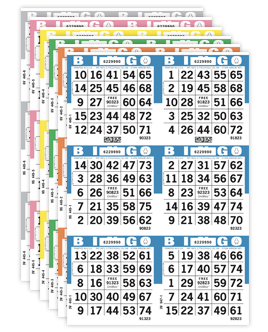 Bonanza Bingo is printed on unique colored paper that is folded and sealed, preventing the face from being seen until it is sold and opened by the bingo player. Call 48 numbers and post them to your Bonanza or Tear-Opens flashboard before your regular bingo session starts. Continue to sell Bonanza Bingo as floor sales until the final game of the night is completed. Based on the 48 posted numbers, a player with a coverall is awarded a jackpot prize. If there is no winner using the 48 posted numbers, call the 49th, 50th, etc., and offer a consolation prize for the eventual winner. Increase your profits by offering a "trade in" option. If a player does not think their card has a chance of winning, they can trade it in and buy another card at half the price.